We train our claims professionals to pay claims quickly and help you take maximum advantage of your coverage. If you are a South Carolina policyholder and you need to report a claim for your car, homeowner's, farm or other property, please call our Customer Service Call Center at 1-800-799-7500. You may also report claims online by logging into your account, under the Member Login section. If you are a Farm Bureau Insurance customer and do not have an online account, please register now. You will need your Farm Bureau membership number to create an online account. If you are not a South Carolina Farm Bureau Insurance policyholder, you will need to contact your local Farm Bureau Insurance office in your state to report your claim. Report the claim: Customer reports a claim through the Customer Service Call Center or online. Claim Assignment: Claim is assigned to a local Farm Bureau Insurance claims professional. First Contact Made: A Farm Bureau Insurance claims professional contacts you to get the facts surrounding the loss and schedules an in-person appointment, if necessary. Investigate: The claims professional inspects and documents damage, takes photos, interviews witnesses and reviews the policy terms. Resolution: Farm Bureau Insurance claims professional works with you to resolve your claim fairly and according to the terms of the policy. Farm Bureau Insurance trains and employs all of its claims professionals, and our claims adjusters are some of the most experienced in the state. Don't just take our word for it. 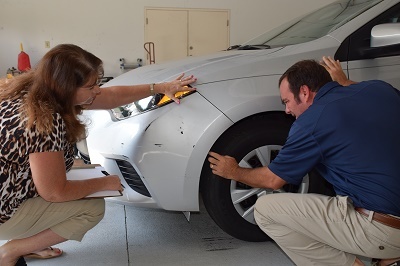 Farm Bureau Insurance claims staff who specialize in collision damage estimates have earned the National Institute for Automotive Service Excellence (ASE) certification. Farm Bureau Insurance has also earned a prestigious I-CAR Gold Class designation. By completing I-CAR's rigorous collision training and testing program, our employees have the most up-to-date training in collision repair. These designations demonstrate our commitment to providing the most accurate estimate possible so that a damaged vehicle is repaired correctly. To help speed up the claims process, each of our South Carolina Claims Service Centers has a convenient drive-in bay where vehicles are inspected on-site. Customers and claimants who have minor vehicle damage, can be seen quickly by on-site claims professionals who assess the damage, provide an estimate and settle the claim within just a matter of minutes. If you don't live near a Claims Service Center, our claims professionals are still just around the corner because we have an office in every county throughout South Carolina.